The vocabularious sequel to the hit PopCap word game. Stop the presses! 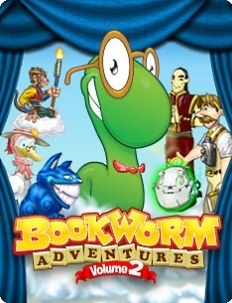 The walls of fiction are collapsing as characters run wild through the Great Library, and only Lex the Bookworm can save the world from certain doom! Build words and battle monsters to survive three storybooks with 10 chapters each. Trade barbs, banter and body blows with over 130 foes, and earn help from fighting friends along the way! The better the word, the badder the damage - so power up with over 20 treasures, including all-new Rainbow Tiles. Work wordy wonders in all four game modes and flex your lexicon in six mini-games. It's a role-playing word game you can't set down! Survive three all-new books with 10 chapters each: Fractured Fairytales, The Monkey King and Astounding Planet! Wield 20+ powerful new treasures against over 130 ferocious new foes! Combine forces with six colorful companions including Mother Goose, the Cheshire Cat and the mischievous Monkey King! Play four game modes: Adventure, Mini-Games, Arena and the infinite Replay mode.